A priest stands inside the Theological School of Halki, perched atop a hill on Heybeli Island off the coast of Istanbul, closed its doors in 1971. It’s kept in pristine condition in the hope that it may reopen one day to educate future patriarchs and clergy. The Theological School of Halki, perched atop a hill on Heybeli Island off Istanbul’s coast, closed its doors in 1971 under a Turkish law that required private higher education to be controlled by the state. Since then, classrooms with desks dating back to the 19th century are ready to be used again at a moment’s notice while dormitory-style bedrooms await the next class of theological students. Since coming to power in 2002, Prime Minister Recep Tayyip Erdogan’s government enacted reforms to improve the rights of ethnic and religious groups in Turkey. Despite pressure from the U.S. and the European Union, the status of the seminary remains unsettled. Erdogan said Halki’s reopening depends on reciprocal measures from neighbouring Greece that would improve the rights of Muslims there. 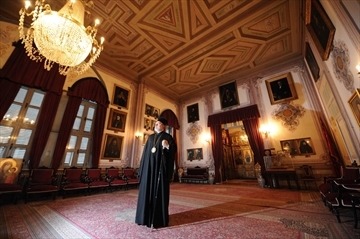 The Halki seminary, founded in 1844, was the training centre for many Orthodox leaders, including current Patriarch Bartholomew I, the spiritual leader of more than 250 million Orthodox Christians worldwide. His patriarchate is considered to be the centre of the Orthodox Christian Church and yet the church can’t train its own clergy, said Istanbul-born Lambriniadis, 46, who was too young to make it to Halki and was forced to study to join the clergy in a Greek seminary.